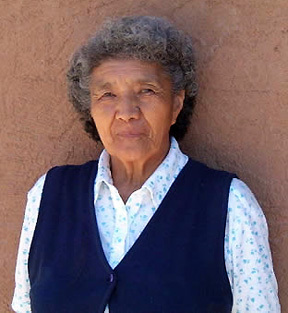 Angela, who was born in 1927 and has been potting since 1955, has undoubtedly one of the longest still active potting careers in Santa Clara Pueblo. She is the daughter of Severa Tafoya, one of the better known potters of the middle 20th century. Angela is a melon pot specialist making various sizes in both red and black. She has three children, David, Alvin and Leona, who also make nothing but melon pots. One could say that Angela is the matriarch of the First Family of Santa Clara melon pots. More information may be found in the Dillingham book "Fourteen Families in Pueblo Pottery," pages 166-169 and the the Gregory Schaaf book " Pueblo Indian Pottery," page 8.